In the following I am briefly reviewing some highlights of the classical bacterial bowel infections, medically called “bacterial gastroenteritis”. The more common among these are cholera, a type of gastroenteritis that is often found after wars and disasters when the drinking water is contaminated. 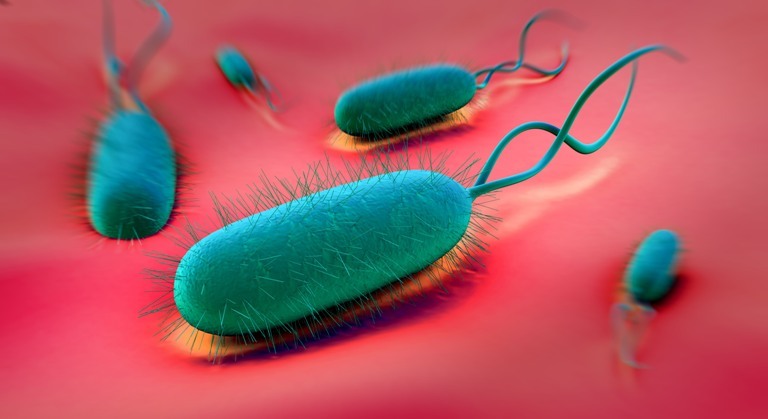 The E.coli 0157: H7 gastroenteritis has been publicized by the newspapers in connection with non-functioning water treatment facilities. Salmonella has its outbreaks here and there, often transmitted in contaminated eggs or mayonnaise. But necrotizing enteritis and shigellosis are also not infrequently found when stool samples of people with diarrhea are sent in for analysis and culture. As discussed elsewhere these are by no means the only pathogens that lead to gastroenteritis as can be seen from this link. In contrast to this in the case of food poisoning after a meal contaminated with staphylococcus aureus, symptoms of severe nausea and vomiting occur 2 to 8 hours following the meal, but the diarrhea is non bloody. These lead to acute abdominal pain with initially watery diarrhea, which within 24 hours turns into a bloody diarrhea. E.coli 0157 is caused from undercooked ground beef (hamburger’s disease). Shigella gets passed on from unwashed hands during food preparation. About 5% of hamburger’s disease cases develop the dreaded hemolytic-uremic syndrome, which has a high mortality. It consists of hemolytic anemia, acute kidney failure and low platelet counts causing severe bleeding. Botulism is passed on by improperly canned green beans or beets. With botulism there is an abrupt onset of feeling nauseous, vomiting and experiencing abdominal pain typically about 18 to 36 hours after ingesting the contaminated food. Occasionally the incubation time might be up to 7 or 8 days. It behaves initially like a normal gastroenteritis with diarrhea, but next neurological symptoms set in. Usually these would start with the cranial nerves affecting vision (double vision) on both sides, bilateral upper eye lid paralysis with drooping eyelids, speech and swallowing problems. This paralysis migrates relentlessly down the body to the breathing muscles and into the upper and lower extremities. The patient stays conscious throughout this ordeal. It is extremely important to immediately call an ambulance and have this patient transported to the Emergency Department of a hospital. The patient will have to be intubated for several days until the paralysis of the breathing muscles wears off. In Campylobacter infection there is initially abdominal pain and diarrhea similar to shigellosis or salmonellosis with blood in the stool. However, there can be then a very high fever( 102 to 103 degrees F, or 39 degrees C). Other complications can set in such as meningitis, septic arthritis , enlarged liver and spleen and bacterial endocarditis(heart valve infection). This infection is transmitted through contaminated water, contact with domestic or wild animals(“beaver fever”), or undercooked contaminated food like poultry. Campylobacter jejuni can be isolated from the stool and in blood cultures. Early treatment with the appropriate antibiotic, based on culture and sensitivity results, stops the diarrhea in 2 days and reduces the stool volumes to about half. Several agents are effective such as doxycycline ( Vibra-Tabs), tetracycline, erythromycin (Ery-Tab,PCE,Eryc,Erythromid), norfloxacin (Chibroxin, Noroxin), furazolidone(Furoxone) and sulfamethoxazole/ trimethoprim( Bactrim, Sulfatrim, Septra). I have listed the brand names in brackets, the generic names in the text. Typhoid fever is caused by Salmonella typhi. This is the worst of the human salmonella infections. In the U.S. there are about 500 new cases registered of this reportable disease. People who had typhoid fever, but thought that it was a viral gastroenteritis and treated it at home, develop a high percentage of carrier state. If carriers of Salmonella work in the food industry (which is unlawful), they could cause a host of new infections. The person who ingests S. typhi bacteria will not feel much for about 1 to 2 weeks, but then develop a sore throat, headaches, joint pains and a fever. Abdominal pain develops and in the 2nd week there may be a pink rash on the chest wall and abdomen (“rose spots”), which are typical for typhoid fever. They disappear without treatment within 3 to 5 days. The temperature goes higher and higher to about 104 degrees F(or 40 degrees C). Abdominal pain may develop more and there could be several complications developing as he bacteria cause ulcerations in the gut. In the small intestine( distal ileum), the ulcerations may now cause bloody diarrhea (about 3rd week), but if one of the ulcers goes deep enough this can suddenly perforate and cause an acute abdomen, which is a surgical emergency. The mortality rate in this state is 25% to 30% even with the best surgical treatment. Other complications include salmonella pneumonia, septicemia, meningitis. Acute cholecystitis can also develop and when this happens, the salmonella bug is extremely difficult to eradicate and despite antibiotic treatment the patient becomes a new carrier. Once the acute phase is over, this type of patient needs to have an elective cholecystectomy with antibiotic coverage before and 2 weeks after the surgery, after which usually the disease is conquered. Typhoid fever should be treated as soon as the diagnosis has been made. In hospital intravenous 3rd generation cephalosporins (cefaperazone or cefotriaxone) are given. Later there is usually a 2 week oral follow-up antibiotic therapy ,depending on in vitro testing, with oral ciprofloxacin (Ciloxan, Cipro) or with ampicillin (Omnipen, Ampicin). Resistant cases respond occasionally to sulfamethoxazole/ trimethoprim (Bactrim, Sulfatrim, Septra). This gastroenteritis is also called “dysentery” or “bacillary dysentery”. The incubation time is about between 1 and 4 days. Diarrhea is first watery, but within 2 to 3 days turns bloody. Shigella is usually resistant to ampicillin and tetracycline. However, often it is sensitive to sulfamethoxazole/ trimethoprim (Bactrim, Sulfatrim, Septra) and this can be used as a liquid for children and as a double strength tablet for adults. For adults two other antibiotics are often used: norfloxacin (Chibroxin, Noroxin) or ciprofloxacin (Ciloxan, Cipro). E. coli 0157:H7 , C. perfringens, C. botulinum and viral gastroenteritis all do not require antibiotic therapy unless there is bacterial overgrowth as a complication. Clostridium perfringes is a particularly vicious bacterium as it produces a toxin that eats through the wall of either the small or large bowel. Outbreaks of this disease have been linked in third world countries to consumption of contaminated dried pork that was not cooked properly. However, it appears that a compromised immune status is required for it to occur and this may be the reason why it occurs more commonly in starved populations in Central and South America, in some parts of Africa and in Asia. But it also occurs in leukemia, AIDS and chronically debilitated patients as well as in low weight newborns and younger children. Symptoms range from mild diarrhea to acute vomiting and acute abdominal pain with subsequent shock from septicemia or peritonitis with bowel perforation. There is a high mortality rate as the tissue damage is often irreversible and it is frequently too late by the time the patient arrives at the hospital.